Tagline- He’s a Cop, She’s a Thief, Together They’re Running for Their Lives. By the time Murphy’s Law was released in 1986, Charles Bronson pretty much worked exclusively for the Cannon Group and the good portion of his films in the 80s were with Cannon starting with Death Wish II (1982). Charles Bronson through most of his career was a supporting actor with such films the Magnificent Seven, the Dirty Dozen and the Great Escape or in the very least co-lead in films such as Sergio Leone’s epic Once Upon a Time in the West. It wasn’t until 1974 with Death Wish when Bronson became a bankable leading man and by that point he’d already been in the film industry for over 20-years. However after Death Wish, Bronson would have success, but by 1982 his films weren’t doing much business as at best they were moderate hits and that along with the paycheck is why he kept making the Death Wish sequels even though by all accounts he wasn’t very fond of them outside of the original film, but with the Death Wish sequels, Bronson got a nice paycheck and a box office hit. Murphy’s Law like the good portion of Bronson’s work in the 80s not called Death Wish was only a moderate success, but his films were big on VHS rentals. Despite starring in film classics like the Great Escape and Once Upon a Time in the West, Bronson’s career always goes back to the Death Wish films and it seems the films he starred in during the 80s are the films most people seem to cite when talking about Bronson’s career outside of the Death Wish films, which is quite unfortunate since even though I enjoyed his films in the 80s, Charles Bronson starred in some truly great films great films prior to the 80s and again even though I liked a lot of his films in the 80s none were exactly on the level of Once Upon a Time in the West. Murphy’s Law won’t go down as one of the best Bronson films as its nowhere near the level of some of the films I’ve mentioned, but with that said it does provide enough entertainment to make a passable viewing. 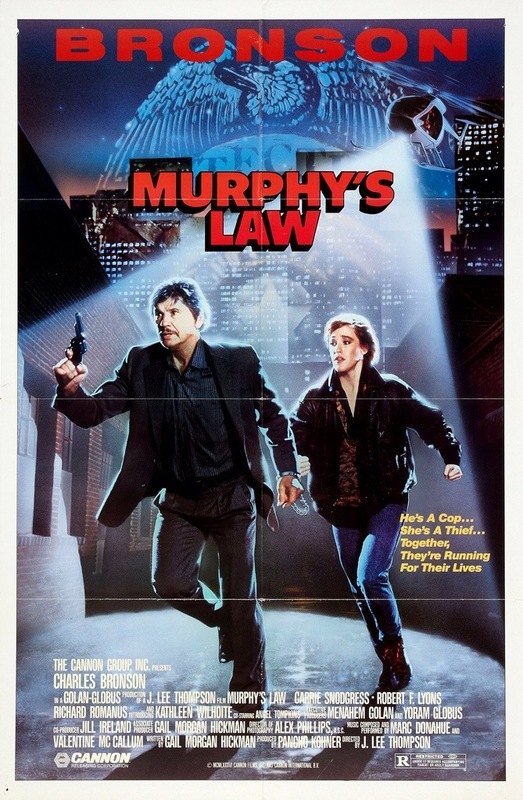 Even among Bronson’s 80s films I’d still rate Murphy’s Law as a middle of the road film as its not as fun as Death Wish II & 3 (though a little below the 4th) and its not as good as Death Hunt or 10 to Midnight, but it is better than films such as Messenger of Death and Kinjite. I guess it’s a middle of the road film no matter how you slice it. Jack Murphy (Bronson) is a cop who’s framed for murdering his ex-wife. While in custody, Murphy is cuffed to Arabella (Wilhoite) a girl he recently arrested for stealing his car. Murphy stages an escape having no choice except to drag Arabella along with him. Murphy sets off to clear his name while the cops and mob are after him. Arabella is listed as an accomplice and she hopes to stay alive long enough for her name to be cleared. The screenplay was written by Gail Morgan Hickman and his other credits would include the Dirty Harry film the Enforcer (story credit) as well as the Big Score and Death Wish 4. Hickman has also written for such TV shows as Crime Story, the Equalizer and the Flash. The screenplay is often fun and the banter between Murphy and Arabella often entertaining. Murphy’s Law is light on plot as the story lacks depth from the history between Murphy and his ex is underdeveloped and the reasoning behind Murphy being framed is also lacking however all this made up for in the fun factor with some really funny bits (some intentional and some not). Every other bit of dialogue from Arabella is some kind of an insult and while funny it does get a little tiresome and than a little annoying and while I suppose the character is in early 20s the insults come across as very immature like something a 14-year old would say. Hickman writes the standard Cannon Group action film and while the plotting could have used a bit more depth and perhaps a little less insults from Arabella, but Hickman delivers a fun script that’s nothing more or less. Murphy’s Law was directed by J. Lee Thompson who at one point in his career was a very successful filmmaker with such films as Guns of Navarone, which earned Thompson an Oscar and Golden Globe nomination. He also directed Cape Fear, Conquest of the Planet of the Apes and Battle for the Planet of the Apes. But later in his career he became more known for B-movies with films such as the slasher cult classic Happy Birthday to Me. J. Lee Thompson and Charles Bronson worked together 9 times as besides Murphy’s Law they also worked together on, St. Ives, White Buffalo, Cabo Blanco, 10 to Midnight, the Evil That Men Do, Death Wish 4, Messenger of Death and Kinjite: Forbidden Subjects. Starting with 10 to Midnight all the films Thompson directed throughout the rest of the 80s were for the Cannon Group with the exception of the Evil That Men Do. Kinjite: Forbidden Subjects would not only be the last film Thompson and Bronson worked on together, but also Thompson’s final film. In an odd twist of fate J. Lee Thompson would pass away on August 30th, 2002 at the age of 88 and Charles Bronson would die the same exact day only one year later in 2003. At this stage in his career Thompson was making B-movies however he always tried to keep his films a little above that, which in someways hindered the productions and in other ways helped them. With Murphy’s Law it’s a little bit of both. The pacing is generally strong and Thompson sets up a fun and light tone. However by the middle the film does begin to run out of steam a little bit, which is more due to the light plot than direction, but to Thompson’s credit he always at the very least keeps things fairly interesting and Thompson also stages some fun action scenes and while I suppose Murphy’s Law wouldn’t be a high mark in Thompson’s career (or Bronson for that matter) its still a fun film and Thompson makes the standard Cannon action film, but flaws and all he almost always keeps it fun. Despite his popularity Charles Bronson never really got his credit as an actor as most people cite his tough guy persona in his films. And no doubt Bronson was one of the great film tough guys, but at one point in his career he was a terrific actor and his performance in Once Upon a Time in the West showcases how talented of an actor he was. After Death Wish it seemed as if all his roles were some kind of variation of Paul Kersey. If he wasn’t playing a Paul Kersey type character he was a rogue cop like in Murphy’s Law and as fun as these films were they didn’t show off his talents as an actor and I could be wrong, but while I know he wasn’t overly fond of the Death Wish sequels he probably felt that way about a lot of the films he made in the 80s and I think he was just sort of going through the motions as these films were the best he could get and probably the best paying and even if his performances while not as strong as some of his past ones, but Bronson still gave in my opinion a decent performance and he’s always fun to watch. Overall Murphy’s Law is an enjoyable film and it has enough to offer to make it a fun viewing. And while the middle scenes might lag in spots, Thompson still retains a fun tone and Bronson is always a joy to watch. If the cabin Murphy goes to looks familiar it should as its the same cabin the Jarvis family lived in from Friday the 13th: The Final Chapter, which came out in 1984 two years before Murphy’s Law.